Browndown, at the far west of Stokes Bay, hosted the last ever recorded fatal duel on English soil! Today it is the Browndown Military Training Area. 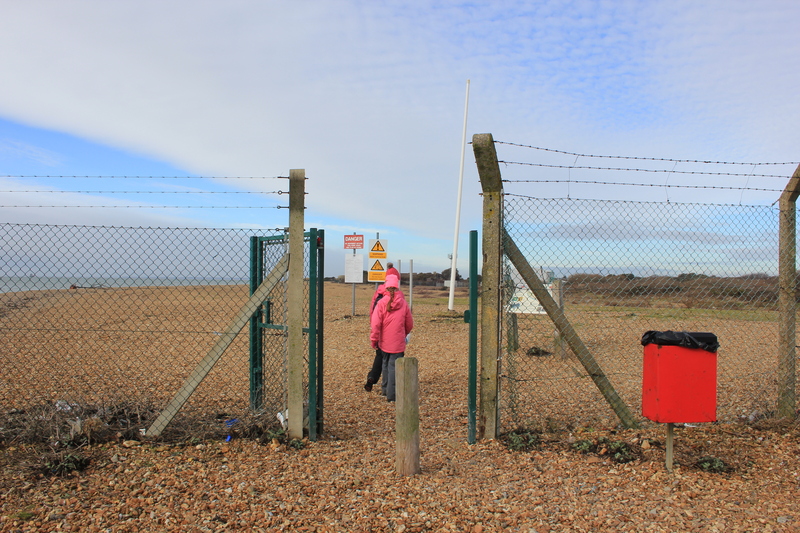 It is surrounded by a barbed wire perimeter fence and gates but there is a right of way along the coastline. We went through the gates and entered the realm of the duelists. James Seton was a wealthy Captain, formerly of the 11th Dragoons. In 1845 he set about seducing Isabella Hawkey, the wife of Lieutenant Henry Hawkey of the Royal Marines. He would visit Mrs Hawkey’s residence in Southsea when her husband was away. Rumours of these indiscretions soon reached Lieutenant Hawkey and he forbade his wife to see Seton again. Alas, at a ball not long afterwards, Isabella partnered up with Seton for a dance. This was too much for her husband. He strode over to Seton, called him a “…blackguard, a scoundrel and a rascal…“. He demanded a duel, failing which he threatened to have Seton horsewhipped down the High Street! Seton declined both alternatives and turned for the refreshment area, at which point Hawkey kicked him (no horsewhip being immediately to hand, I presume). After more heated words, Seton accepted the challenge. It was agreed that the two would meet on the following 20 May. The place was to be Browndown, then a secluded common. As the sun was setting the two men and their seconds met. Fifteen paces were measured out and the duelists handed their pistols. On the first exchange Seton missed his opponent, whilst Hawkey failed to fire at all; his pistol had been handed to him half-cocked. Hawkey demanded a second shot, whereupon both men fired. Seton missed again, however, Hawkey’s shot found its mark. It struck Seton’s hip bone, travelled through his belly and exited his groin. Hawkey, with astonishing gallantry, immediately exclaimed, “I’m off to France!” and disappeared without even waiting to see how Seton was! Poor old Seton went through quite an ordeal. First of all he lay bleeding and had to wait for two surgeons to come out from Gosport. They pulled off a window shutter from a house and carried Seton onto a yacht, which took him to Portsmouth. He was taken to a hotel and had to wait for another surgeon, all the time bleeding. The three surgeons did what they could to stop the hemorrhaging, but failed to stop it altogether. Thus, they decided to go further and operate on the iliac artery in Seton’s pelvis. Unfortunately, the three surgeons felt rather out of their depth in this, and so summoned a fourth surgeon – all the way from London! The operation was a success and the bleeding stopped, but then “unfavourable symptoms” appeared. According to the Annals of Portsmouth (1880), “the unhappy man, being of a vigorous constitution, slowly and painfully fought with death, which at length ended the dreadful scene”. His wife never left his side, which given the source of his troubles in the first place, seems very sporting of her. Hawkey and his second were both charged with wilful murder and warrants issued for them. They eventually surrendered in March the following year. Their defence was that it was not the shot that caused Seton’s death, but rather the “meddlesome operation” performed by the poor surgeon who had some all the way down from London to try to help. The jury, swayed by the “powerful appeal” of Hawkey’s counsel, and taking into account that Hawkey had received significant provocation from Seton, returned a verdict of not guilty. A few years later Isabella had an affair with another officer whom Hawkey then attacked. He was court martialed and removed from his post. His wife left him, he fell into debt, and died seven years later of TB. He should have horsewhipped Seton down the High Street and been done with it. This entry was posted in Hampshire and tagged Browndown, coast, duel, duelists, Hampshire, travel, walking. Bookmark the permalink.